Youthful. Graceful. Beautiful. These are just a few qualities that come to mind when gazing at a gorgeous bouquet of pink flowers. Whether you want this arrangement to say "Happy Anniversary" or "Happy Any Day," you can be sure the day it arrives will be brighter for anyone lucky enough to receive it. 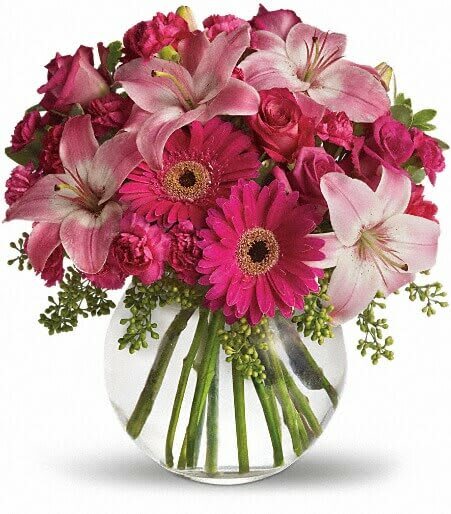 Lovely pink roses and asiatic lilies are joined by hot pink gerberas and miniature carnations, pink full-sized carnations and more in a clear glass ball. Send this one and life will be a bowl of cheer!